How would you feel if a widely quoted journal on environmental issues turned out to be sponsored by the Shell Oil? What would you think about a journal on contraception published by the Catholic Church? Would you believe anything in a journal on the public health impact of gun violence published by Smith and Wesson? I’m going to go out on a limb and guess that you would immediately discount anything in those journals as biased toward whatever improves the bottom line of the business that finances the publication. That’s why it is important for everyone to know that Birth: Issues in Perinatal Care is also financed by industry. 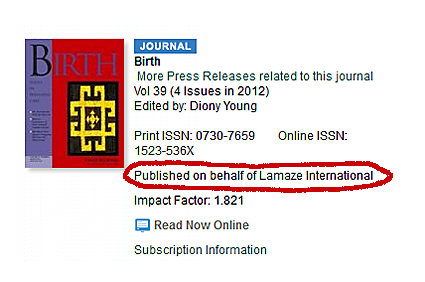 The specific company that sponsors the journal is Lamaze International and the industry is the large, multi-faceted, multi-billion dollar “natural childbirth” industry. Since 1960, Lamaze International has provided the most comprehensive and respected education program for Lamaze teachers available. Lamaze’s membership is comprised of 4,000 childbirth educators, health care providers, and parents. More than 10,000 professionals have earned the LCCE credential, and a significant portion of childbirth education classes are taught by Lamaze Certified Childbirth Educators. Among its many services, Lamaze operates the Lamaze Media Center, which offers a wide selection of books, videotapes, audiotapes, and specialty products related to pregnancy, labor, birth, breastfeeding, and early parenting. Lamaze has also established the Lamaze Approved Provider Program, whereby hospitals, birth centers, group practices and other institutional providers are recognized for meeting Lamaze standards and offering excellence in childbirth education. Don’t get me wrong. Lamaze International is perfectly entitled to promote its products, just like the oil and tobacco industry are entitled to support their products. But the rest of us are not only entitled to discount their publications as biased and self-serving, we would be extremely foolish to do otherwise. Similarly, we are not only entitled to ignore Lamaze International publications as biased and self-serving, we would be extremely foolish to do anything else. That is why it incredibly disturbing that a publication that purports to be a scientific journal is sponsored by industry, in order to create an aura of scientific legitimacy around industry policies, and without regard to what the scientific evidence really shows. I don’t expect the folks at Lamaze International to be even remotely concerned about the deception involved in an industry sponsoring it’s own “scientific” journal, just as I don’t expect the tobacco industry, the oil industry, or the gun industry to feel bad about deceiving the public through industry produced propaganda. However, I do expect journalists and others to be very wary of “papers” produced by those journals, and I do wish that the sponsorship of such journals would be displayed more prominently on the journal itself as well as accompanying every citation of a paper published in such a journal.